When Grab is no longer enough, what happens next? 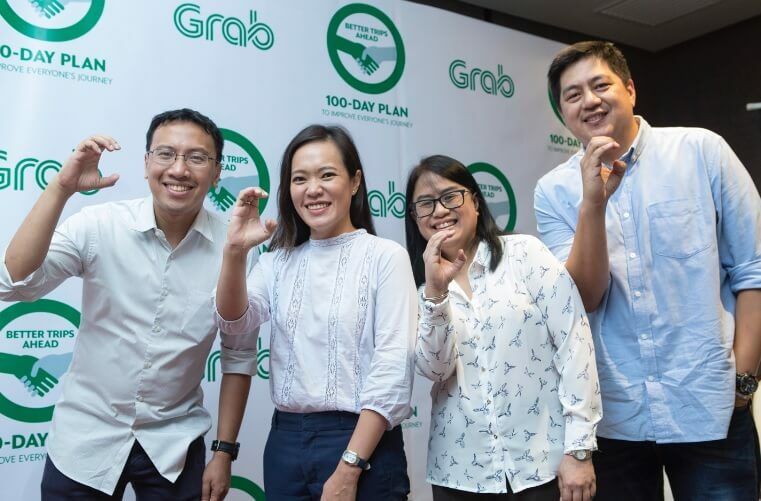 Recently, Grab announced the status quo on its ride-hailing service in the Philippines – revealing that there’s an overflow in demand and severe under-supply of cars. Hence, we’re all getting a hard time booking a ride these days. Personally, as a Grab passenger, I always use TNVS apps to make my ride more comfortable and convenient. However, as Uber bids goodbye in the country, booking a ride on Grab is becoming more and more expensive and harder. I’m sure that am not the only one who’s experiencing this, as many Grab riders already expressed their thoughts about this ride hailing drama. In fact, some even shares their strategies on how to get a ride easier, such as noting an additional fare to drivers and more. And yes, some simply longs for Uber – and with that, I second the motion. In this hard time, it’s easy to hate Grab, not until you understand why this is happening. So, here’s the thing. 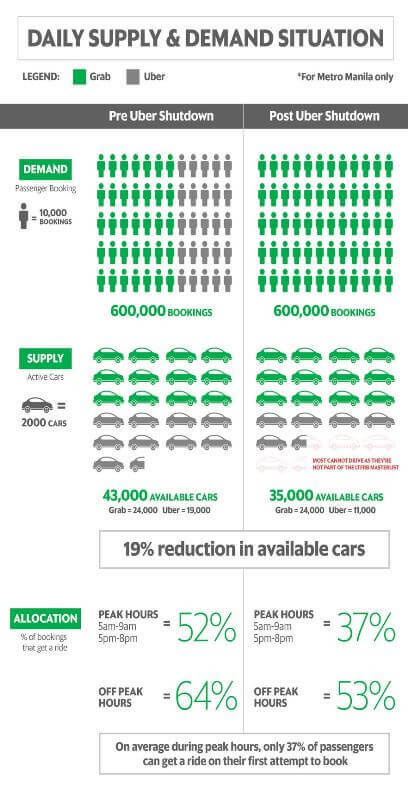 Knowing the simple law of demand and supply, Grab revealed that only 35,000 cars are available to serve about 600,000 daily passenger booking requests. Definitely, Grab drivers couldn’t handle this demand. If you don’t believe me, then, do the math. Grab explained that before it acquired Uber, the two companies had 43,000 cars at the most. However, it is now down to 35,000 vehicles as only 11,000 active Uber cars jumped to Grab. Considering that Uber used to operate 19,000 vehicles in the country, we can conclude that PH’s ride hailing service now has 19% lesser cars to serve the public. What is the reason behind this? Well, this is due to the 6,000 active Uber drivers that were not part of LTFRB’s audited master list of TNVS drivers. And as per regulation, Grab cannot accept these drivers if they’re not part of the said list. Meanwhile, the other 2,000 missing Uber drivers simply decide to not join its rival’s platform. To address this dilemma, Grab has appealed to LTFRB to allow the displaced 6,000 Uber drivers in joining new ride-hailing companies just to meet the rising demand of the riding public. Also, with about 20% of the riding public relying on ride sharing apps like Grab, supply is sure to be a major concern. Nevertheless, there are new regulators and ride-hailing companies entering the industry, which might help in equating the unmet demands in the country. But looking beyond the missing 6,000 cars, Grab looks for more solution to solve the overflow in demand. One of these is the 100-day Driver Transformation campaign that eyes to improve drivers’ behavior and welfare, provide better ride experience, and upgrade customer support. Another solution seen by Grab is to give incentives to partner drivers who tirelessly serve the riding public. Through this, commuters can assume that drivers will be more eager to accept rides even without minding their pick-up points and drop-offs. And as someone who wants to improve the current situation of TNVS in the country, a rider must take action, as well. By that, the company encourages riders to maximize vehicles by sharing their rides with other passengers through GrabShare. A win-win situation for both parties since it’s way cheaper than regular rides. Then, the next step in the equation is to add more cars, isn’t it? After all, when demand and supply are equal, riders will be satisfied while ride-hailing companies can focus more on upgrading their service rather than explaining such issues.